This PSD brochure mockup presents an A4 size 4-fold brochure in multiple viewing angles. The first brochure is displayed laying on a flat surface with its outer folds fully extended. The second brochure view displays your design on a standing product (also fully extended). 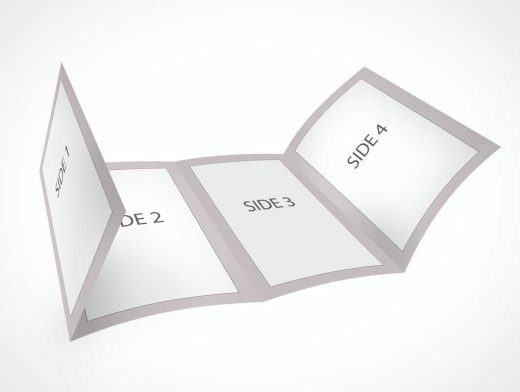 Each brochure panel is conveniently provided in its own group and layer allowing for easy customization — for example, toggle off the visibility of panel 1 or panel 4 and you have a tri-fold brochure instantly.